1. 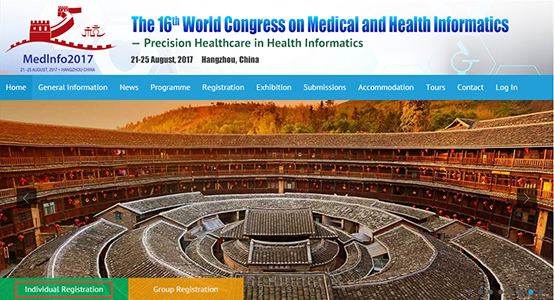 Open the website www.medinfo2017.org and click the “Individual Registration” . 2. Sign in with your account, or create an account if you don’t have one. 3. Fill out the forms, click ”confirm and Register” to complete the registration. 5. Click ”Personal Information” can do the changes. 6. 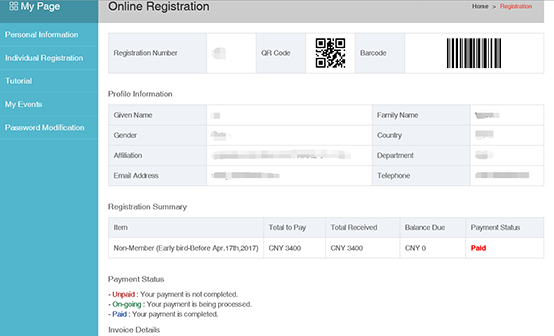 Click ”Individual Registration”, choose the correct membership, and have the payment. Please note you cannot choose “Tutorial” separately. Online” and click the “Confirm my registration” button. required information. And click the “Continue” button to complete the payment. 10. If you pay by RMB, please choose the bank type and submit. to try again” to try again. to go back to individual homepage again. Form” to get a confirmation form.